One step closer to holograms? 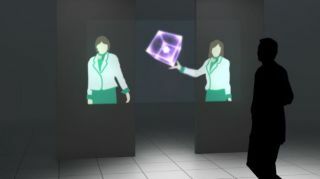 Mitsubishi is developing a hologram-like display that projects images in mid-air, with aims for it to be ready by the 2020 Tokyo Olympic games. Though not quite a hologram, the company explains it creates a floating image by using a beam splitter to divide light into transmitted rays and reflected rays, which bounce off of a retro-refractive sheet. The divided beams then meet to create an image measuring 56 images diagonally. Light is projected from the screen, which sits on the floor, while the beam splitter sits about 1 meter away from it. The retro-reflective sheet bounces the divided light from the splitter to create the hovering image that you can stick your hand through, or even walk through. However, Mitsubishi explains that people may find it difficult to focus on such floating images, as we are not yet accustomed to viewing aerial images displayed without physical cues. To combat this, the company is using visual cues on the wall behind where the midair image will appear so people will know where to look. Mitsubishi believes this tech could end up being used in public spaces and possibly as early as the 2020 Olympic games. The company says it could also be used as a way to communicate with people remotely, though you probably shouldn't expect to see it in homes for many more years yet.